Toward a Bioregional State: On Self-Divided Election Strategies in Environmental Politics: Why Wedge and Lose When You Can Unify and Win? On Self-Divided Election Strategies in Environmental Politics: Why Wedge and Lose When You Can Unify and Win? This is a four point commentary upon the recent mid-term elections in the United States in 2014. All four of these points have been mentioned in previous posts about how different is the bioregional state in its recommendations for strategies toward sustainability and fuller democracy. However, it is good to summarize succinctly these four points because it may help people craft better political strategies for environmental politics, cultural politics, or even class politics to be more representative. To begin, there are two major mistakes of 'internal' party strategy in general that are to blame for bad electoral defeats. Both are variants of the same mistake: building political party appeals of class, environment or even culture as mere wedge appeals. Wedge appeals are inappropriately divisive and destructive of support, instead of successful in aggregating support. One of these wedge mistakes is the naive political strategist's assumption that people 'should or will' vote only for their class politics or only for their environmental politics. Plus, some assume that these two appeals 'are more real' or 'are supposed to' override other cultural issues. The other wedge mistake is even worse: it is the political party strategic assumption or prediction that people 'should or will' be unified by simultaneous wedge appeals: like expecting people to be unified by various specific admixtures of cultural vanguard politics linked to specific views of environmental politics or specific class politics--instead of truly divided thrice by it. However, there is a more successful way to merge all three environmental, cultural, and class politics. This is discussed in the conclusion. To illustrate these two wedge mistakes, I found a nice editorial cartoon recently, posted above. It paints two kinds of pictures about wedge issues. One is a nice illustration of the assumptions of the first mistake: the illustrator's false assumption that people 'should have' voted exclusively to their class interest or 'should have' voted exclusively to their environmental interest. The other actual data in the cartoon describes how political parties accidentally (or even intentionally) can insert wedge cultural appeals to divide up peoples' more common class or environmental interests. This goes for the right, the left, and the green. In the United States currently, for the right, this seems an intentional strategy of inserting cultural wedge appeals to keep other more unifying class and/or environmental politics divided. For the left, this seems a silly unthoughtful attempt to divide up widely shared class interests by attempting to merge it with particular cultural wedge sentiments as against other cultural sentiments, and attempting to merge it with particular forms of environmentalism against other forms of environmentalism. For the green, this seems another silly unthoughtful attempt to divide up widely shared environmental politics by only appealing to small ideologically filtered fractions of it based on certain class positions and certain cultural positions. 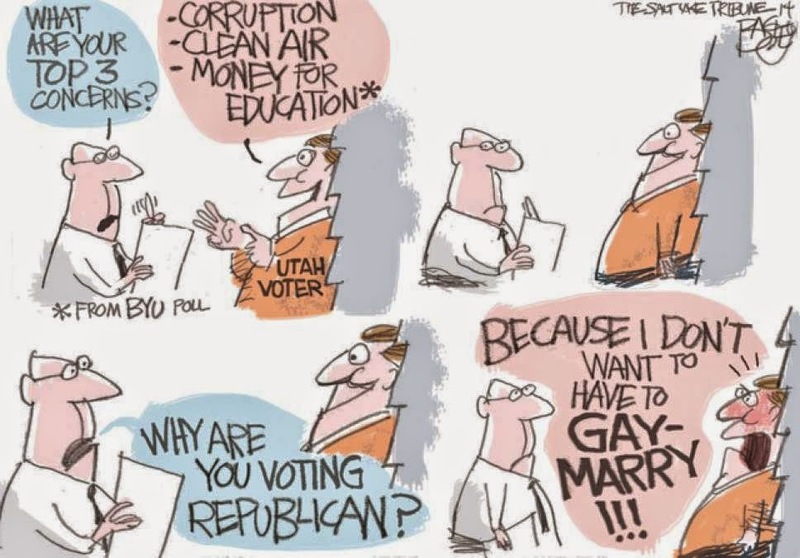 So while the illustrator laughs at Utah, the political positions that he wants are really what are losing and laughable--or is that tragic? However noble or required are such competitive mobilizations, if most left or green-left parties choose strategies that employ wedge issues, they become rather predictably tragic. Particularly, I am unsurprised, despite massive green supermajorities in the world, that green parties are self-defeating themselves by thinking they have to be simultaneously class position Marxist parties or have to be cultural vanguard parties while they mobilize environmental politics. They are innately going to fail repeatedly with such halving strategies. Instead, learn how people vote first in such blurred ways, so avoid intentionally choosing such wedge issues inserted into environmental politics. It can only result in better crafted unifying strategies for class or environmental politics to separate them from such halving cultural baggage appeals. Then you might have a better strategy and even a better and more competitive politics. However, of course party failures are hardly only a question of 'internal' strategy faults. There are other 'external' rationales why such a competitive politics fails as well. For these external rationales, first, there is an ongoing gatekeeping and repression against actually competitive parties. So it fails to really matter whether Democrats or Republicans win, if it is a rigged game on many commonly shared gatekept policy points they have together that are mutually degradative and mutually gatekeeping. Much of Toward a Bioregional State is dedicated to how to check and balance against such informal gatekeeping of incumbent uncompetitive and unrepresentative parties that want to remain unrepresentative while continuing environmentally degradative crony policies to boot. I expect the open violent repression in the United States against wider voter choices and against more representative voter choices is likely to keep getting worse before it gets better. This is because Americans are leaving Democrat-Republican duopoly politics quickly. From early 2014, there is now a record 53% who say that Democrats or Republicans "don't represent us." Plus, the United States now has lowest upward mobility compared to nine other developed nations w/higher upward mobility, and one-third of American children now live in poverty. On the one hand, these two parties could change their strategies to win elections based on what people want to improve situations like this. They could be more representative. On the other hand, I expect both will choose more ongoing repression and artificial terrorism scares to hold their unrepresentative and even tyrannical duopoly intact. The bioregional state has better solutions than either of these gatekeeping parties on the following two interlinked points:  for how to generate a more competitive party context that would encourage all parties to field for elections  in a more competitive and representative context of geophysically real spaces. Respectively, the bioregional state suggestions are a combination of stable watershed election districts and PRMA voting rules interactions--and many more. These two at least are described below. Second, however it is clear that corrupt parties hate to represent any geographically real spaces. They prefer to gerrymander their wins. It is clear that the Republicans do a better job gerrymandering election districts and electoral rolls than the Democrats--even though both do it. However, the bioregional state has solutions for gerrymandered districts in stable watershed districts. These stable watershed districts for elections have a nice synergy with different PRMA voting rules, mentioned below, that get all parties competing for 100% of the same voters, which will ramp party incentives toward appealing to all 100% instead of mere partial appeals while most voter's interests languish and are ignored. Third, the bioregional state has solutions and protections against vote fraud in the counting of elections as well--a solution that equally encourages greater party competition as well. This is done via the greater competitive party dynamics created by PRMA voting rules. These voting rules generate party incentives: to poll to the 100% of the voting public instead of just tiny slivers of it; to woo each others' voting publics instead of specializing and creating elections of artificially mobilized wedge divisions and hatreds; and PRMA voting rules make parties very interested in policing against vote fraud themselves. This is because PRMA requires getting clear what are the real final percentages instead of parties tolerating and covering up vote fraud in it. If the actual percentages of votes are transferred into the actual power percentages of the elected seat, under PRMA voting rules, all parties will police each other against vote fraud more closely when tiny percentages matter for real in how much vote power their win gets. This is contrary to the present situation where it is unimportant what the actual percentages are, which encourages all parties to develop corrupt deals to disguise or to rig the vote count between themselves or to have deals with each other against their voting public to cover up each other's fraud. So with PRMA voting rules, there are finally political party incentives for small parties to challenge the vote on mere tiny defrauded percentages instead of it being unimportant, just as it is equally important for big parties to attempt to construct much wider appeals and unifying appeals than they are accustomed to in the past, because for small or large parties these small percentages can mean real power differences. So to summarize, there are many 'external' different tactics to maintain corrupt gatekeeping, vote fraud, and gerrymandering from both Republicans and Democrats. This keeps keep people and agendas down or divided. It is obvious from these 'external' points alone about elections that the United States still is more organized on violence and repression against actually competitive parties or even competitive markets or actually competitive districts. As said, those 'external' points are not addressed specifically here, though have been addressed in the past: http://biostate.blogspot.com/2008/04/fresh-shoots-from-dead-tree-bioregional.html. However, a fourth point should be belabored as well: how those interested in better environmental politics or better representative class politics still can be to blame 'internally' by choosing bad strategies themselves. They can be to blame when they choose self-defeating wedge strategies. These come in several flavors. One of them is assuming that people will ever or 'should' vote entirely or only their class interest. Another is that people will or ever 'should' vote entirely their environmental interest. Another is that people will or ever 'should' vote only their cultural and civil rights interests. So politics is hardly only class. It's cultural. It's environmental. It is simultaneous. This is how people vote. On the other hand, some parties choose internal strategies that intentionally bring these three issues together as wedge issues and divide up their support. On the other hand, some parties can choose differently and bring these three issues together as unifying issues. So, how would a party bring these three issues together in more unifying ways? On the other hand, to avoid class wedge issues, a more successful way to appeal to such issues of class specifically would be to appeal to all classes--particularly to small business owners and to workers, in the same cultural regions, across left and right, as unified culturally and regionally against larger corrupt crony concerns in their regions that demote all their life chances, their class chances, and their environment by polluting them more than anything else in their region. In other words, particularly I would avoid cultural missionary quality of much of left and green politics--attempting to forcibly change or to indoctrinate people, cultures, minds, etc., from the top down instead of attempting to represent them in more unifying ways. I suggest that current party vehicles/strategies on such divisive wedge cultural issues and divisive wedge class issues are going to divide up the already wider and winnable demographic on cross-class concerns and geographically situated environment concerns that many culturally conservative right and culturally progressive left share. So current party strategies (and current leaderships that keep doing this) keep doing the insane act of introducing culturally divisive issues into potentially winnable cross-class concerns or cross-ideological geographic-regional environmental politics. Such wedge issues are not going to get you where your class or environmental politics want to go: though are only going to hamper and divide them. We require a better way to establish a party politics of environmental citizenship and regional virtue, instead of a party politics of wedge-based ideological factions. If you want a party for cultural change or a particular class position, then establish one for that. Though attempting to drive some wedge issues of a tiny vanguard cultural support (that is not shared) into the widely shared cross-class concerns of a particular cultural region, and attempting to drive that wedge into a widely shared geographic and cross-ideological environmental concern will be an expected failure.